Having contributed the a successful Kickstarter campaign that claimed to “harness the power of phase change to keep your beverages cold” last year, we were excited to put the product to the test. In this post we compare both versions of this new product to two other cooling mechanisms we have on hand. There seems to be a never ending variety of ways to cool a beverage or keep a cold beverage cool. From giant cubes and giant spheres that claim to melt slowly, to reusable things that don’t involve melting such as soapstone cubes and gel filled stainless steel cubes. As we have previously determined, methods that don’t involve melting only cool about as well as a well chilled glass. So, we were excited to see a recent Kickstarter project that was producing stainless steel balls that contain a food grade liquid that freezes and melts. How do Spirit Steels compare to other cooling devices? Since the spirit steels contain a substance that will melt, it should be able to absorb much more heat than simple gel filled stainless steel cubes. However, the rate at which is can cool will be partially determined by the rate at which heat can move away from the beverage through the stainless steel. With ice the heat is absorbed directly by the ice without passing though an intermediate medium. Therefore, we expect that an ice sphere will cool fastest reaching the lowest minimum temperature, followed by the spirit steels, with gel filled stainless steel cubes being the worst. Measure temperature of bourbon bottle using infrared thermometer. Adjust tap water to match initial temperature of bourbon using instant read thermometer. Fill large graduated cylinder with at least 8 fl. oz. of water temperature water. Using the infrared thermometer, record temperature of the inside of the tumbler. Measure 2 fl. oz. of water using small graduated cylinder. Add “Baller” to tumbler, ideally so it will not touch the probe when added. Suspend the probe thermometer in the tumbler using clothespins, binder clip, and tall glass, being careful to keep the tip away from the side of the tumbler and the baller, if possible. Add water to the tumbler. Record temperature of water for 20 minutes. Repeat steps 4 through 10 with different tumblers using Spirit Steels “shorty”, ice sphere, and two gel filled stainless steel cubes. Dispose of the water in an environmentally friendly manner. Repeat steps 4 through 11 using bourbon instead of water. Enjoy the bourbon responsibly with fellow doers of science. The following graph shows the cooling curves for water over a 20 minute period. Cooling curve for 2 fl. oz. of water using four different cooling devices. 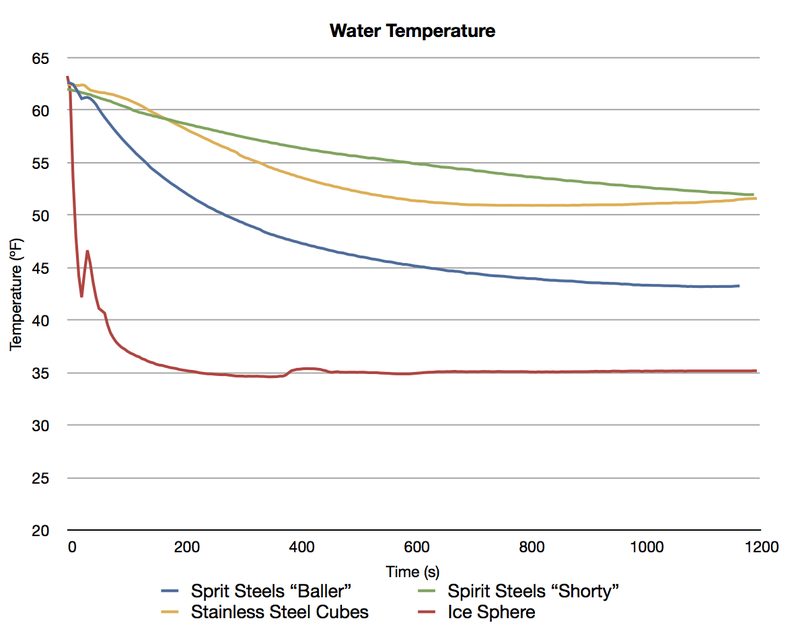 This graph shows the cooling curves when bourbon is used instead of water. Cooling curve for 2 fl. oz. of 100 proof bourbon using four different cooling devices. When performing the ice sphere trials, it was impossible to keep the probe away from the ice and still have the tip of the probe in approximately the same location in the glass. Since the probe was touching the ice, the temperature drops initially, then jumps up considerably when the liquid is added. The tip of the probe was also in contact with the side of the glass for most/all of the trial. Therefore the ice sphere results are only provided to provide and approximate bound on the amount of cooling a large chunk of ice can provide. The overall results are summarized in the following tables. The first table shows the measurements using water. The same measurements were repeated using bourbon instead of water are given below. From the graphs and the tables, we can clearly see that an ice sphere is able to cool much more effectively than any of the stainless steel methods. This extra cooling however came at the cost of introducing 14g-28g (0.5-1.0 fl. oz.) of additional water. Of the non-diluting methods, the “Baller” was clearly the most effective, cooling the water nearly twice as well as the “Shorty” or the gel filled cubes. Strangely, when cooling bourbon the “Baller” didn’t perform as well as it did with water, although difference in final temperature after 20 minutes was only ~1ºF, and still well below the temperature the other methods were able to achieve. The much larger mass of the “Baller” probably contributed to its advantage. The comparison of the gel filled cubes and the “Shorty” was mixed, but were of comparable masses. The cubes initially cooled much faster, presumable due to a larger surface area in contact with the fluid, but quickly leveled off, and was actually increasing by the end of the experiment. The “Shorty” however continued to cool slowly but surely until it caught up to the cubes at about 20 minutes, and would probably have surpassed the cubes if the experiment had been run longer. Apparently the barometric pressure was much lower than when the bourbon was bottled. When we opened it, the cork came out with some force, and fog formed in the bottle. As expected, the ice sphere provided the fastest cooling, reaching the lowest final temperature, but also significantly diluted the liquid it was cooling (increasing its volume 25-50%). Of the non-diluting methods tested here, the Spirit Steels “Baller” was the most effective at cooling both the water and bourbon. The gel filled cubes out performed the Spirit Steels “Shorty” in terms of initial cooling, but after about 10 minutes the “Shorty” started to catch up and would most likely surpass the cubes in a longer trial. Since this experiment tested how well various cooling devices perform when tasked with cooling a liquid from room temperature, what if we started with an initially cold beverage, such as a Martini? Would the ice sphere still outperform the “Baller” in terms of keeping it cold so it can be savored slowly? Also, now that the Spirit Steels “Baller” has proven to be more effective than other non-diluting cooling techniques and the Spirit Steels “Shorty” is comparable to gel fill cubes in a 20 minute trial, how will they perform over longer periods of time? One interesting comparison would be an equal mass evaluation. I notice that from your measurements the masses of the cooling methods vary between ~50 g and ~120 g. I suspect that if ~100 g of each method (ie, use 1 baller, 2 shortys, 4 cubes, and reduce the size of the ice sphere if possible) were used in a test, the results may differ from the results obtained in this test. The reason we used only two steel cubes instead of three (as per their instructions) or even four was to keep the mass close to the mass of the shorty. There are also problems with fitting the cubes into the glass such that they don’t stick out of the fluid being cooled. 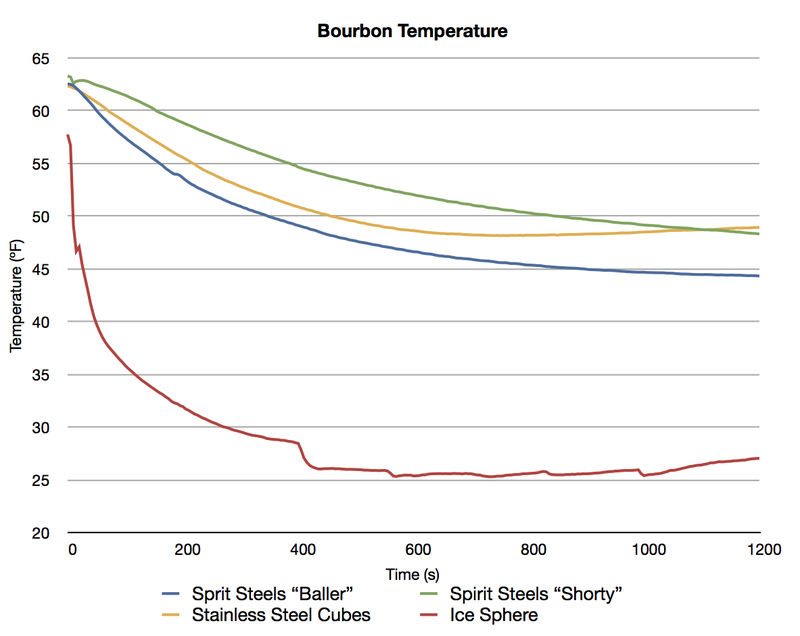 In a previous post “On the cooling of whiskey,” we did use three stainless steel cubes which had a combined mass of 80.2g (closer to the baller than the shorty), and they did cool better than just two. Not as well as the baller though, even in terms of ºF/g. Based on the results of our test “On the shape of ice: Spheres vs Cubes,” matching the surface areas of the different methods might be more interesting than trying to match their masses.